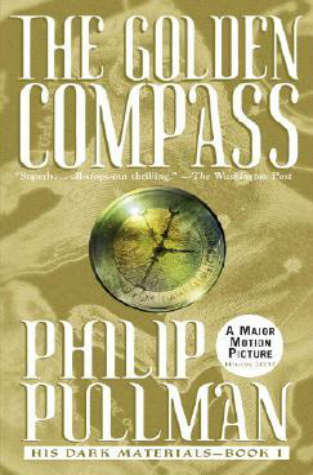 In the astonishing finale to the His Dark Materials trilogy, Lyra and Will are in unspeakable danger. With help from Iorek Byrnison the armored bear and two tiny Gallivespian spies, they must journey to a dank and gray-lit world where no living soul has ever gone. All the while, Dr. Mary Malone builds a magnificent Amber Spyglass. An assassin hunts her down, & Lord Asriel, with a troop of shining angels, fights his mighty rebellion, in a battle of strange allies—& shocking sacrifice. As war rages & Dust drains from the sky, the fate of the living—& the dead—finally comes to depend on two children & the simple truth of one simple story. 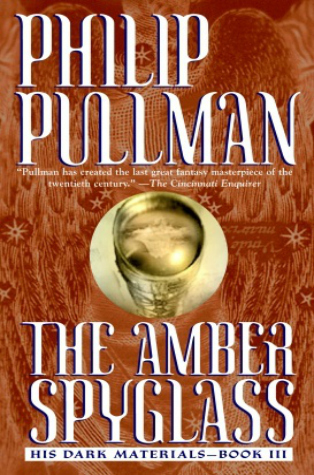 The Amber Spyglass is the third and final book in the 'His Dark Materials' (or The Golden Compass) trilogy. 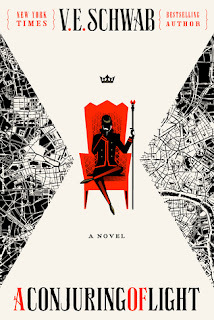 As a whole, this series has so many things that appeal to me - I'd really enjoyed book one, The Golden Compass and had high hopes for the series. 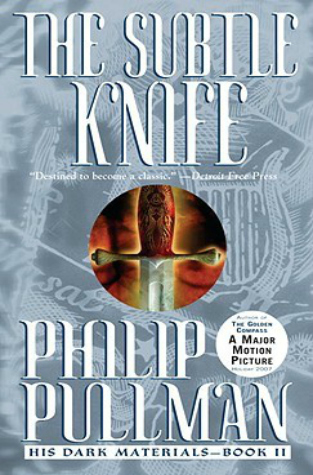 Book two, The Subtle Knife introduced appealing new characters, but it became obvious that the series was building up to be a retelling of a very popular biblical story - which had left me with very mixed feelings about what I was expecting out of the story as a whole. All these factors added up with me taking a prolonged break from the series between books 2 & 3 - almost an entire year as a matter of fact! I just really wanted to go into The Amber Spyglass prepared for the worst (preachy- religion speak *ahem*, *cough* *last two Narnia books* *splutter*...oh my, excuse me! So yeah, I knew I needed to be in the right frame of mind if I wanted to be able to enjoy it in any way. So, The Amber Spyglass picks up right where The Subtle Knife left off, with Lyra & Will separated and both in their fair share of danger, though Lyra is decidedly worst off. As Will works hard to make his way back to Lyra to save her, powerful forces are at play and the sheer fabric of the world(s) around them seem to be coming apart around them. Enemies are closing in on all sides and it's hard to tell who the allies are. Most the previous characters from books 1 and 2 return for book 3 so there are a lot of players on the field here. There is also a LOT of things going on simultaneously throughout the book - I mean, this book is STACKED with action and information, much of it new which is a rare thing in a final book to see SO many new elements being brought in. The Amber Spyglass especially felt a lot more complex and mature than the other previous installments were, but it still fit in with the general tone of it's predecessors. Now that I'd made my peace with overall direction of the story, I found that I was able to enjoy the ride a bit more too. One of the best parts of this story is the magical instruments featured/used - like the Golden Compass itself, the Subtle Knife and in this specific book, the Amber Spyglass. They are just absolutely brilliantly thought out, original & dead practical. My personal favorite is Lyra's Compass which she makes a bit more use of this time around than she did in book 2. Will's knife is another amazing tool but it's also really scary when you think of it o_O If you're like me and you get really excited with clever magical tools and items than this series definitely delivers. Another highlight in the His Dark Materials series are the characters themselves. I love how real they all feel; flawed and oh so human while simultaneously being admirable or even heroic. 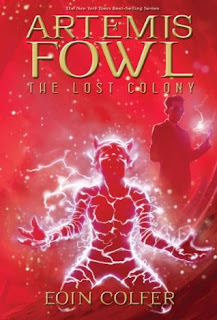 All the characters here are very readable, I loved getting to know them all - Will & Lyra being obvious standouts. Lyra was always memorable since the start of the series but she's grown and she's been through so much...seen so many things, but through it all she manages to stay true to her character. Will made a wonderful addition in book 2 he continued to impress in The Amber Spyglass - he's strong, brave and he balances out Lyra's fire & grit nicely. I'd say I connected with both of the equally this time around :) The polar bear Iorek Byrnison, the witch Seraphina Pekkala, Mary, Mrs Coulter & Lord Asriel all return as well and as supporting characters none of them disappoint; each one has an important role to play. The Complete Trilogy - I love the use of Gold, Silver & Bronze tones ! This for me was a very exciting trilogy. The concepts introduced were all so unique to me. I read it a long time ago, just out of high school and remember savoring the read, on the edge of my seat wondering what was going to happen. I really like the daimon concept, too. 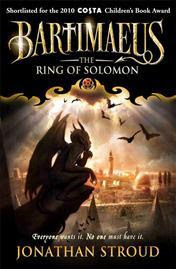 I really loved this trilogy, I read it when I was in 7th grade and adored it. It was so different and I still want a daimon. I'm glad I'm not the only person who found the last Narnia books way too much..and that ending made me want to through the book across the room. PS-OMG @ the last Narnia, ugh I was so let down. I though I was ready for it and it still annoyed me SO much. Ugh! It's been soooo long since I've read this series. Like, over a decade. It's one of my top favourite series though and I would love to reread it sometime. I'd be really curious to see if I like it just as much or if I get anything more out of it the second read through. Honestly, I have no idea what popular biblical story this was a retelling of (I've lived a very secular life) so that part would still be lost on me in a reread. But I would SO love to return to the brilliant world Phillip Pullman has created - LOVE the creative magical objects and the amazing characters, as well! 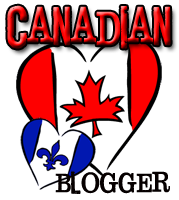 Anyways, it was really interesting reading your thoughts on this versus Narnia! Awesome review. StS *25* - BEA Edition!! !